OAKLAND, California -- As a fresh NBA champions cap sat a tad off-kilter on his head, Kevin Durant embraced mother Wanda. Then he moved across the podium and hugged Stephen Curry before accepting his shiny MVP trophy, holding out his arms and hoisting it for everyone to see. From the Bay all the way to OKC. 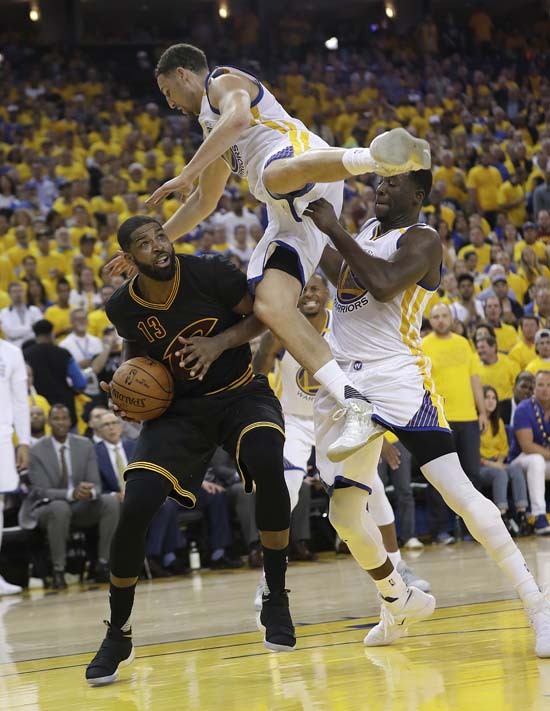 Durant capped his spectacular first season with the Warriors by bringing home that coveted NBA championship he joined Golden State last July so determined to get, scoring 39 points in a fast-and-furious, Finals-clinching 129-120 victory over LeBron James and the Cleveland Cavaliers in Game 5 on Monday night. "You can talk about whatever you want to talk about, but nobody comes in and cares about the game or loves the game as much as I do or works as hard as do I at the basketball game. You can talk about whatever happens on the outside, but inside those lines, I come to bring it every day," Durant said. "I work hard, I believe in myself, I believe in the game, I respect the game, I love the game, and I knew at some point in my life that it will come around for me." 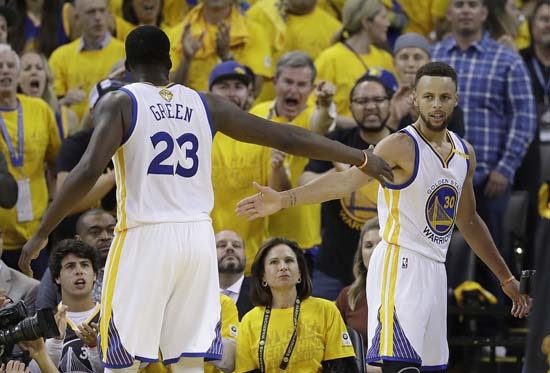 Stephen Curry added 34 points, 10 assists and six rebounds as Golden State closed out its second title in three years after squandering a 3-1 lead a year ago. 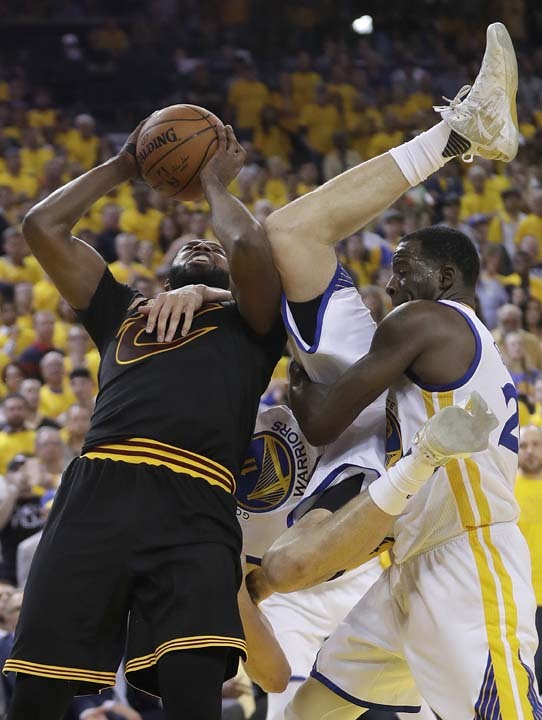 That stung ever since, and even Durant understood, because he gave up the same lead to the Warriors a round earlier with Oklahoma City. James, who in 2012 with Miami beat the Thunder in Durant's only other Finals, wound up with 41 points, 13 rebounds and eight assists. 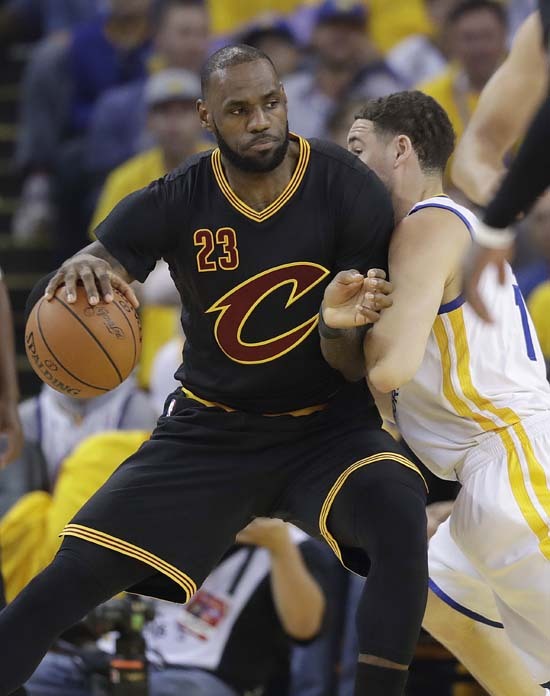 "I left everything on the floor every game," James said after averaging a triple-double in his eighth Finals. 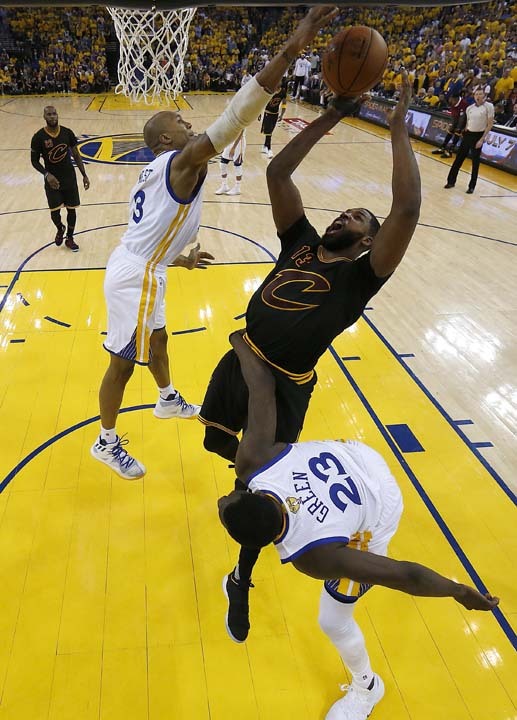 Kyrie Irving followed up his 40-point gem in Game 4 with 26 points but shot 9 for 22. 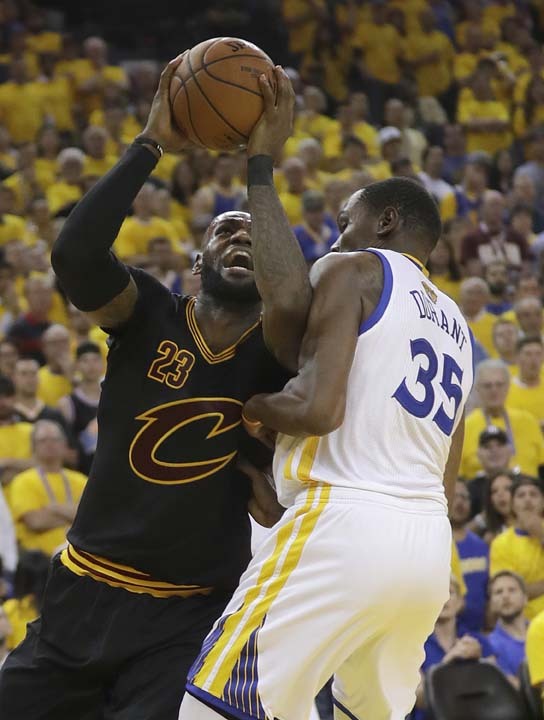 This time, King James gave way to KD, who was the NBA Finals MVP 10 years after being picked second in the NBA draft behind Greg Oden. 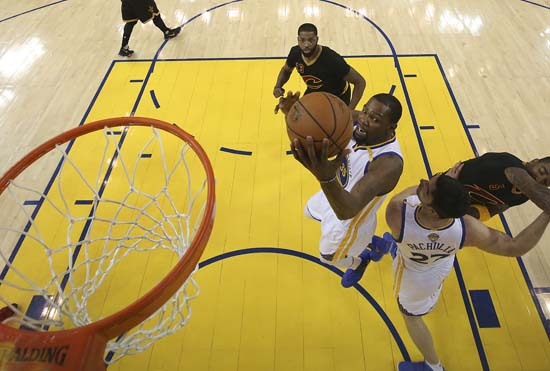 Durant drove left, right and down the middle, knocked down 3-pointers, dished and dunked. 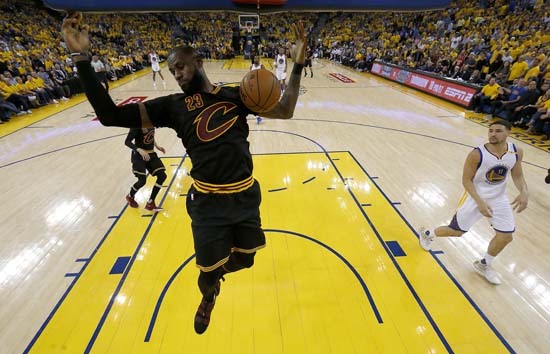 He hit a 17-foot fadeaway over James early in the fourth quarter, then assisted on a 3-pointer by Andre Iguodala the next time down as the Warriors pulled away. 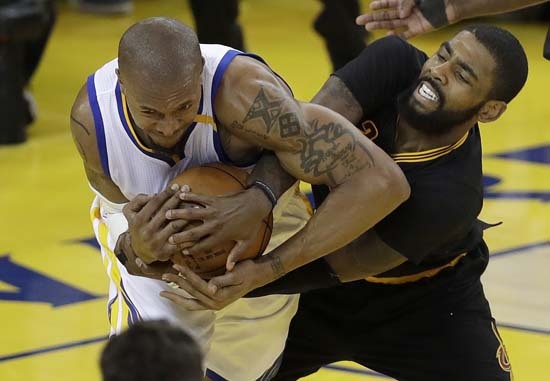 Iguodala, the 2015 Finals MVP, came up big again with his 2017 postseason-best 20 points off the bench in a testy, tightly called finale to this trilogy Finals that everyone had stamped on the calendar from the moment Durant departed Oklahoma City to join Curry and Co. last July. 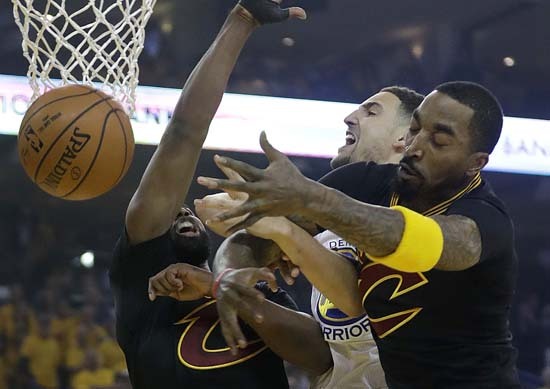 The Warriors won in 2015 before the Cavs made their historic comeback last year. 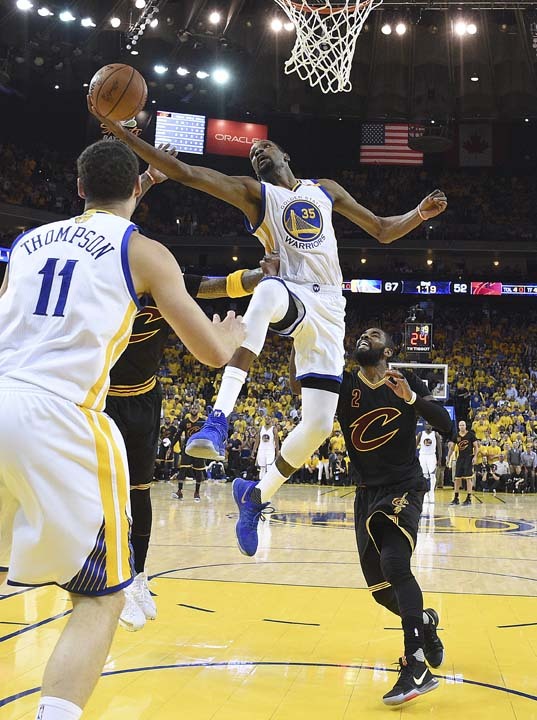 Then it was Golden State's time again, with Durant as the prized addition. 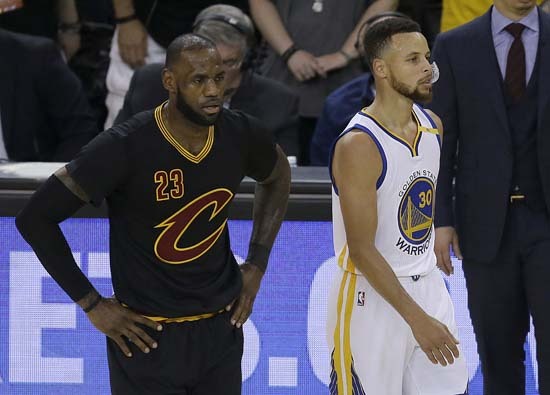 Sure, the Warriors missed becoming the first undefeated champion, but 16-1 still gave Golden State the best winning percentage of any title team at .941. 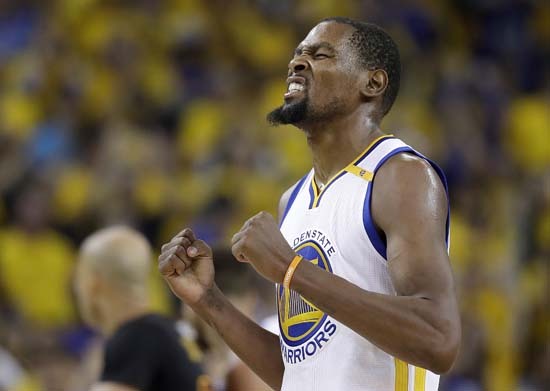 Durant shot 14 for 20 and Curry - the two-time reigning MVP who took a backseat as the new big star got acclimated - finished off a brilliant postseason. Not to mention a healthy one after his 2016 injuries. Green stayed on the court in a game that featured three technicals on one play 3:08 before halftime. 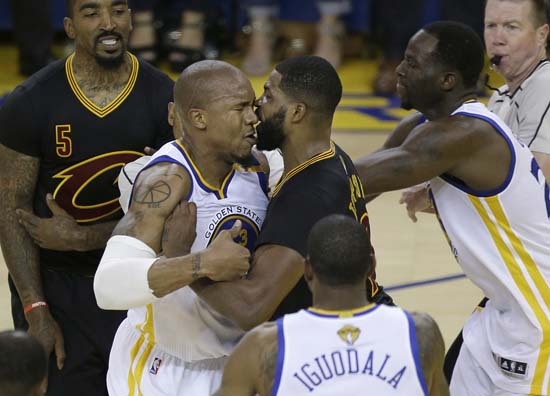 David West fought for the ball with Irving, then they got tangled up and Tristan Thompson entered the fray and he and West went at each other face-to-face. 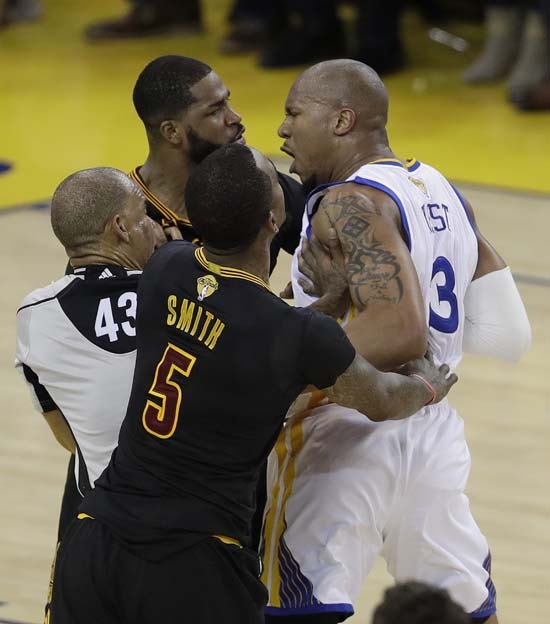 West, Thompson and J.R. Smith received techs after a replay review. 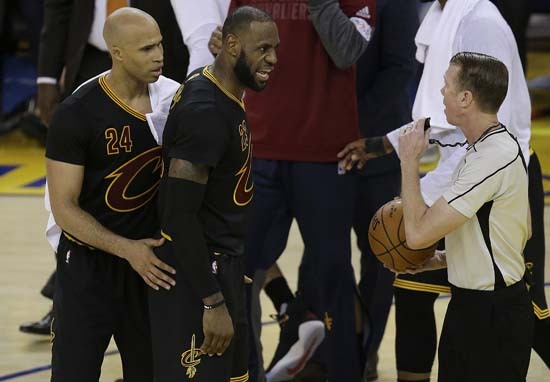 Green had sat out this very game a year ago, suspended because of flagrant foul point accumulation after he swiped at James' groin in Game 4. 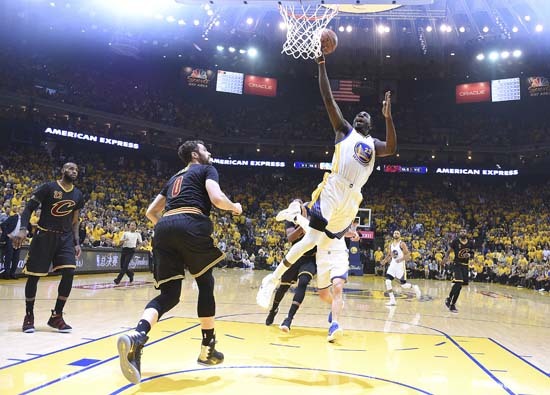 He had 10 points, 12 rebounds and five assists in the clincher. "I had a letdown last year," Green said. "If KD was the consolation prize to lose, thanks for that loss, and we're champs this year." 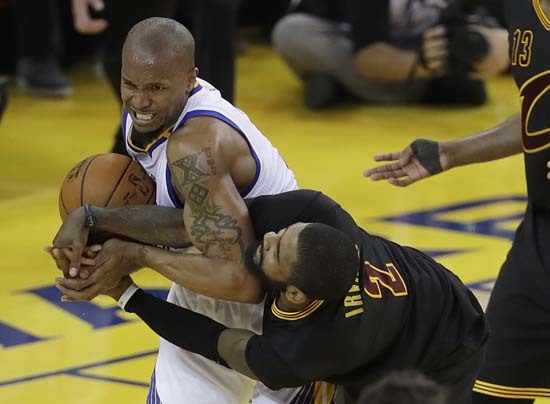 With a much-improved bench led by Iguodala, JaVale McGee, Shaun Livingston and West, that "Strength In Numbers" slogan that has become such a staple the past two seasons shined all season long, from Durant's 19-game absence late in the regular season with a left knee injury to assistant coach Mike Brown stepping in for 11 postseason games to lead the way while Steve Kerr was ailing. Golden State used a 28-4 second-quarter run to take charge - just after it appeared Durant should have been called for a third foul on a basket by James - and got to celebrate right at home in Oakland surrounded by a deafening home crowd waving yellow rally towels and holding up phones to shoot video and photos as the final minute of the clock ticked away. 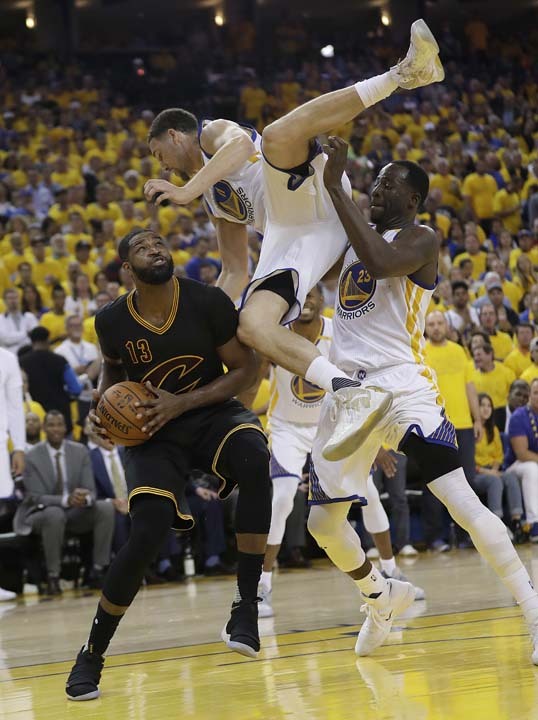 The Warriors became the first Bay Area team to capture a championship at home since the A's finished the Los Angeles Dodgers in Game 5 of the 1974 World Series. 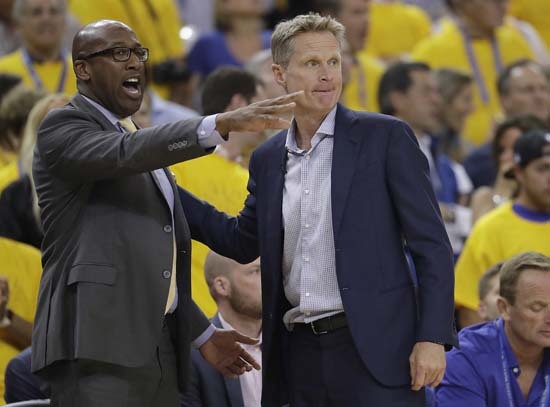 A year ago, these Warriors fell short after a record-setting season that included a 24-0 start and 73 victories at the end to break the 1995-96 Chicago Bulls' wins mark. Then they got Durant, who after the buzzer sounded did a little shake with Curry on the court before they slapped hands several times. Two playful superstars who found a way to coexist through all the questions and constant scrutiny, together and smiling as champions. 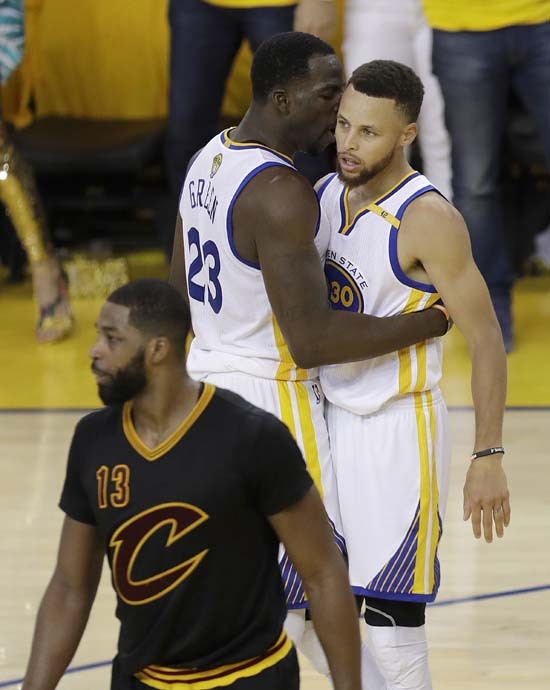 "I'm happy for him," Curry said. "You've got to call Kevin Durant a champ now."